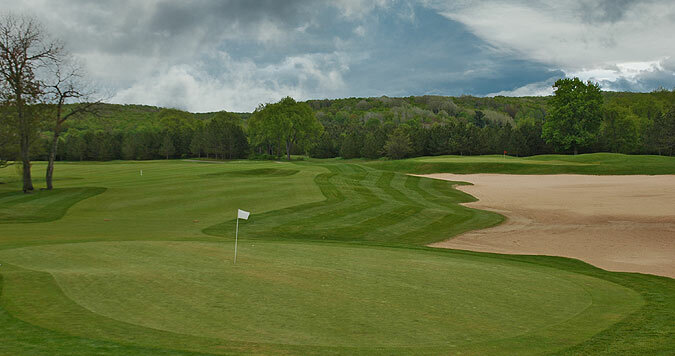 Boyne features three top notch resort properties with 162 holes of some of the best championship golf in northern Michigan, all available for public play. 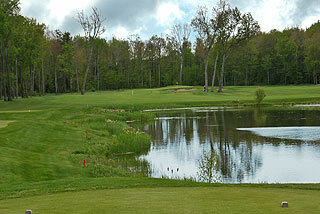 With designs by renowned architects Robert Trent Jones and Arthur Hills along with a course that plays tribute to Donald Ross, Boyne has received high recognition from national publications including Golf, Golf Digest, Golf for Women, Michigan Golfer - with several layouts listed in Golfweek's Top 100 Resort Courses in the Country. For information on the property as well as info on golf packages, visit the Properties' website by clicking here. 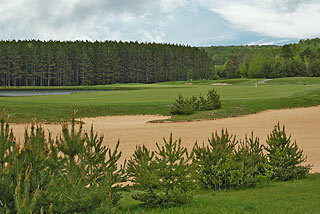 Boyne Highlands Resort features four world-class designer courses - the Robert Trent Jones Heather Course, The Moor, The Ross, and The Hills. 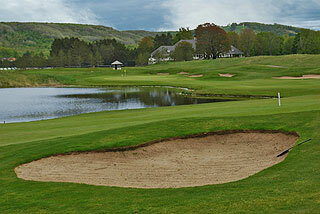 Also on property are the Boyne Golf Academy and the traditional facilities of the Country Club of Boyne, as well as a par three course (lit for night play), a unique putting course, plus the First Tee of Boyne Highlands. Membership opportunities - which include a Members-only course and 6 other layouts, swimming, tennis, dining and spa facilities, are being promoted in 2018. The resort amenities include nearly 400 hotel rooms and suites designed on over 3,500 acres of natural and manicured settings. Activities include a fitness area and wellness center, swimming pool and hot tubs, chair lift rides, hiking, biking, croquet, badminton, tennis courts and various dining options. 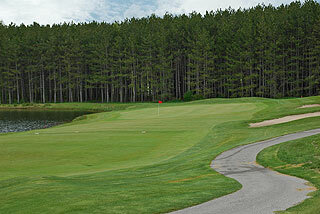 For more info on the resort, visit our page for Boyne Highlands with direct link to their website by clicking here. The Arthur Hills Course at Boyne Highlands is a gorgeous championship design that offers expansive waste bunkers and challenging water hazards along a beautiful rolling terrain, with ample landing zones off the tee and recovery areas greenside. The setting is one of the most serene of all the Boyne courses, with marsh and wooded areas providing homes for abundant native wildlife. The sprawling waste areas and intricately designed traps that highlight the green complexes provide the need for careful shot placement. 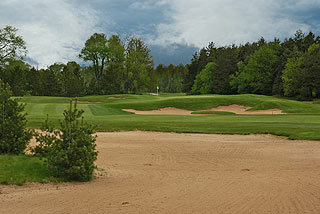 Water comes into play on 4 holes and 57 sand bunkers are situated along the course. 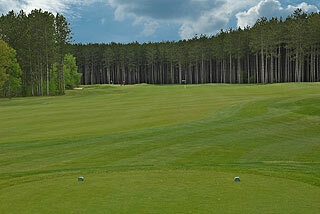 This is the longest course of the 8 layouts in the Boyne portfolio, and from the tips it has the highest slope rating of the courses at Boyne Mountain or Boyne Highlands. There are six sets of tee boxes that play to distances and slopes measuring 7312 yards/144 slope, 6919 yards/139 slope, 6352 yards/130 slope, 6127 yards/128 slope for men and 138 slope for women, 5615 yards/123 slope for men and 134 for women, and 4811 yards with a slope of 117 from the front tees. 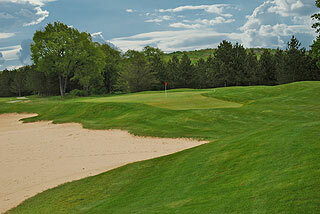 The Hills Course has many memorable holes, including the par four 17th and par five 18th. The former alternates its tee boxes from both sides of a large lake with a split fairway servicing each side, and number 18 doglegs left with the fairway narrowing on the tight approach to a challenging green complex. 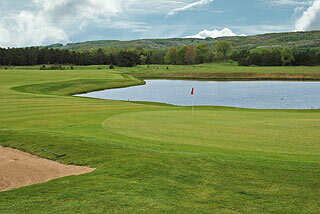 These are two of the most challenging holes of the layout, creating an exciting finish. For more info, visit our page for the Hills Course with direct link to their website by clicking here.